Welcome back to TheCityFix Picks, our series highlighting the newsy and noteworthy of the past week. Every week, we’ll run down the headlines falling under TheCityFix’s five themes: integrated transport, urban development and accessibility, air quality and climate change, health and road safety, and communications and marketing. One million visitors descended upon San Francisco -a city of about 805,000 people- for “event-ageddon”, a compendium of a military events, the Italian Heritage Parade and ball games, and packed public transit and largely avoided driving into the 2nd most densely populated city in America. Washington D.C.’s cycle-hire service, Capital Bikeshare, released the results of its annual ridership survey, indicating that riders reduce motorized travel by nearly 5 million miles per year on the District’s roads and save about $819 in personal travel costs. While the number of long-term Bikeshare members is robust at 18,000 riders for the two year old service, only 3-percent of members identify themselves as African American in a city where over 50-percent of the population identifies as such. The provincial government of South Africa’s Gauteng province, home to Johannesburg, has vowed to invest R10.3 billion (about US$1.16 billion) in expanding the existing Johannesburg BRT, Rea Vaya. The expansion, which would also reach the surrounding cities of Ekurhuleni and Pretoria, is coupled with efforts to spur job creation in South Africa’s largest economy, which regularly registers a 25-percent unemployment rate. In the wake of several American jurisdictions removing red-light cameras, devices that record license plate data of drivers who illegally pass through red lights, a study has found a 300-percent increase in the dangerous crossings. Nearly 700 fatalities are recorded annually in the United States. Red light technology in Long Beach, California has been used to increase corridor safety. The City’s transport authority has coordinated signals along a dangerous stretch of Wardlow Road to increase red light frequency, effectively curbing speeds of traffic dynamically and slowing down speeding drivers. Delhi, whose BRT network has been recently challenged in regional courts, is considering an elevated 9.7-kilometer (about 6 miles) dedicated right of way that would connect an existing bus terminal to the capital’s metro rail system. The corridor is expected to draw 154,000 daily riders by 2016. 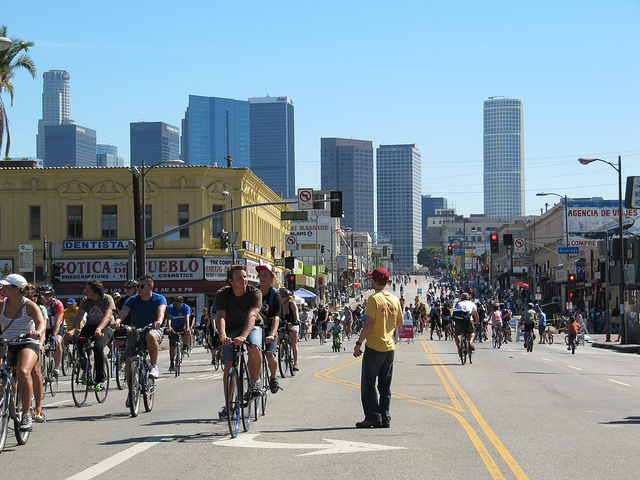 Downtown Los Angeles closed off its streets to cars and attracted 100,000 cyclists for CicLAvia, Los Angeles’ rendition of ciclovía, the weekly pedestrian and cycling celebration pioneered by Bogotá. This weekend’s CicLAvia expanded the 5 hour surge of cyclists to new neighborhoods reaching from East LA to Hollywood with plans to expand further with increased political will and public participation. Public transport ridership continues to slide in Brisbane, Australia, as 300,000 less trips were taken in the past fiscal year. The loss comes at a hard time for transit in Brisbane as the city has seen its third fare increase in three years, Aus$18 million (about US$18.4 million) in fare evasion and campaign commitments being strained by a promised 7.5-percent annual fare increase. HM Shivanand Swamy, the designer of the Ahmedabad BRT System, Janmarg, has recommended a modified BRT technology calling for smaller buses and narrower rights of way to the the Union Urban Development Ministry of India. The “mini BRT” systems are being recommended for Tier II cities, those which have a population between 50,000 to 99,999. INSW, the transportation infrastructure authority for the Province of New South Wales has officially supplanted a light rail corridor with an underground BRT corridor to relieve congestion on Downtown Sydney. The Aus$2 billion (about US$2.04 billion) project reccomendation found that light rail in the central business district would actually increase traffic congestion. Two weeks before Cape Town was set to launch an integrated public transport authority, City Officials have gained support from the region’s cab drivers. Samta, the regional taxi association, is pleased with their inclusion in the City’s Integrated Rapid Transit plan, which is set to create a unified ticket transport system, from rail to roads, by 2018. As U.S. unemployment dipped below 8-percent for the first time in 3 years, 17,000 jobs were added to the transportation sector, chiefly in trucking and rail. TheCityFix Picks, December 28th: Chinese High Speed Rail, New York Subway Tango, Indonesian Mini Bus BRT?